We don’t often do ‘repeats’ at our monthly masterclasses. With over 100 distilleries in Scotland, and even more outside of the fabled north we try to mix things up a bit. However, sometimes we give in to temptation and ask someone back for another go – joining that tiny list of luminaries is Balblair’s John Macdonald, distillery manager and thoroughly nice chap. John’s last visit to our humble London abode was way back in the mists of time, in the year 2009. 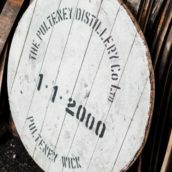 A time of wonder, slightly shonky website design and a distinct lack of blog posts about our whisky tastings. John came down then to show off his distillery’s latest range of vintage bottlings and this time he was back for more of the same, bringing along the latest releases of their range. 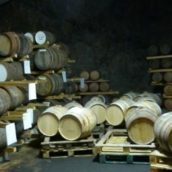 Rather than delve deep into the history of Balblair, a trait that leads to long and sprawling blog posts, I’ll merely point you to a long and sprawling blog post that I wrote when I visited a couple of years back. Not a lot, as you’d hope, has changed since then: their visitors centre has been finished; Ken Loach’s The Angels’ Share has been released; they’re running a full 7 day production cycle; they’ve cut the fermentation time by a wee bit to fit it into the new schedule; and they currenly (as of the day before the tasting) have 25,444 casks maturing on site. All in all, business as usual. Nose: Thick, oily and grainy, with butter, stewed apples and lemon. Palate: Sweet red apples, a hint of tropical fruit and some darker notes at the end, all backed up with freshly crushed grain. Finish: Fruit, porridgey grain and lingering apple skin. Comment: I’m surprised by how much these line up with my notes from the last time I tried it, my palate seems to be nicely consistent at the moment – a great fruity spirit, with some balanced darker notes and lots of good grain. Nose: Butter toffee, lemon zest, light cream and hints of pineapple sweetness. Palate: Sweet to start, with apples, apple chews, peach and apricots. That’s balanced by some perfumed wood and woody spice that take the edge off. Finish: Sweet cream and apple skin. 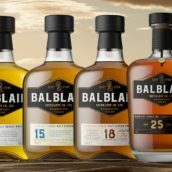 Comment: A great intro to the Balblair range – light, sweet and creamy, with the appley notes that I’ve come to think of as the core of their bourbon cask flavour profile shining through. 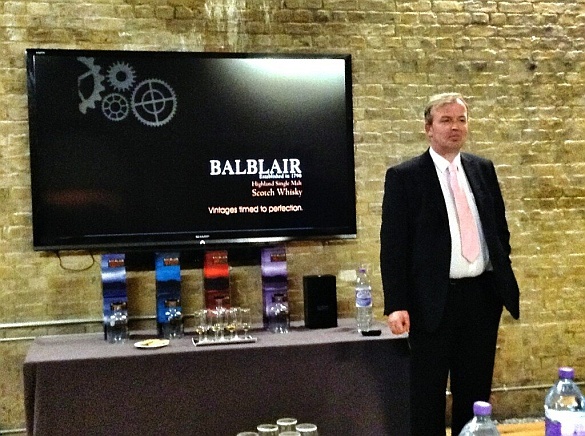 We then moved on to a reused vintage – Balblair 1997 second release. The first edition was brought out back in 2007 as the entry level whisky in Balblair’s range, bottled at 10 years old. It’s now returned with a few more years on the clock, bottled last year and matured in first fill ex-bourbon casks. Nose: Custard topped tropical fruit – mango skin, papaya, fresh pineapple. Along with that there’s the trademark crunchy green apple, rich porridgey grain, fudge and a touch of menthol. Taste: Creamy porridge, then sultanas, pineapple and apple chews. The fudge notes from the nose come through as well, dosed with a spot of rum. Finish: Lots of cinnamon spice, green apple skin and some dry wood. Comment: The first fill casks have had their effect, bringing out lots of spice on the finish and amplifying the fruity notes. Maybe slightly woody for some, but packed full of fruit. Nose: Pineapple, gummi fruit chews, darker fruit hints underneath – fruit cake and a touch of spice. Palate: Sweet and creamy with a pleasantly oily mouthfeel. 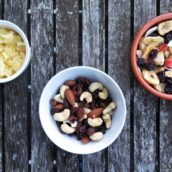 Spicy up front, with cinnamon and cracked black pepper, before fruity apple, stewed rather than crunchy, and a touch of banana cream. Finish: White chocolate, apple skin and polished wood. Comment: The banana has moved further back than in previous versions and some more woody spice has crept in, but it remains balanced. Nose: Cocoa, sharp apples, sweet syrup, rich riverbank earth and a touch of charcoal. Palate: Lots of sweetness up front, followed by zingy aniseed balls and milk chocolate, green leaves and lots of spice – cinnamon fireball gobstoppers and a touch of clove. Finish: Cracked black pepper, sappy wood and even more cinnamon fireballs. Palate: A rich but restrained nose leading into a big and spicy palate, and an equally spicy finish. You need to like pepperiness and dark wood, but if you do then you’ll love this. Nose: Sweet, warm leather, cream, dark stoned fruit, demerara sugar, polished dark wood and a touch of the trademark apple, although baked in their skins with cinnamon. Palate: Light woody smoke, polished wood and sweet apple, with black pepper spiciness and some dark wood richness. Finish: An initial burst of fruit followed by charcoal, and lingering apples and leather. Nose: Sweet glue and fruit backed up by a lick of woody smoke. Old polished oak with a fruit basket – apples, pears and maybe some blowtorched banana – vanilla extract and crushed evergreen leaves. Palate: Sweet to start, turning soft woody and spicy as it sits in the mouth. Vanilla cream, green apples, black pepper, Good Old Wood, fruity gummi chews and an underlying layer of spicy wood smoke. Finish: Lingering pepper, apple and sweet wood. Just as you think it’s done, floral hints and some fruity dark chocolate creep in. Comment: Again, quite different to the younger whiskies but with that crisp fruity note still sitting in the middle. It’s sad that this is almost all done, but I’ve tried the replacement 1969 and it’s a cracker. To see what happened on the night as it happened you can click over to Storify to see the tweets from the tasting, and to see some pictures from my visit to the distillery head on over to Flickr.